Do you have symptoms that seem to mysteriously come and go, such as brain fog, fatigue, headaches, joint pain, or digestive issues? Or are you generally not feeling your best from day to day, and suspect it might be related to your diet? If so, there’s a good chance you could be dealing with an undiagnosed food sensitivity. And the food(s) you are sensitive to may be one you would never suspect. In fact, it’s quite possible that a seemingly “harmless” food that you’ve been eating (maybe even daily your whole life!) is to blame for your symptoms! And yes, food sensitivities can be behind your symptoms even if you are eating a clean, Paleo, or AIP diet! 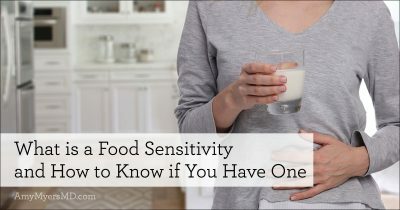 In this article, I will help clear up your questions about what a food sensitivity is (hint: it is NOT the same as a food allergy! ), how to know if you have one, and what to do about it. The first thing I want to note is that food allergies and food sensitivities are two very different things. A food allergy triggers an extreme and potentially life-threatening reaction, known as an IgE-mediated immune response, whenever you are exposed to a certain type of food, such as peanuts or strawberries.1 Most allergic reactions happen within minutes and can range from mild—think hives or stomach cramping—to severe, such as anaphylaxis, which can impair your breathing, cause a dramatic drop in blood pressure, and affect your heart rate.2 Due to the severity of food allergies, you likely already know whether or not you have one. A food sensitivity, on the other hand, is more difficult to diagnose because it triggers an IgG reaction in your system, which is a delayed immune response. It could take up to 72 hours for symptoms of a food sensitivity to present. The problem with this delayed response is that you likely eat a wide range of foods in the time it takes for symptoms to appear, making it difficult to spot a pattern between the specific foods you eat and your symptoms. For example, let’s say you’ve been having migraine headaches and digestive issues. You eat scrambled eggs, fresh sliced tomatoes, and a banana every morning for breakfast, and you think maybe it’s something in your breakfast that’s bothering you. So on Monday you decide not to have the scrambled eggs to see if you get the migraines and digestive issues. Later on in the day, the headache and digestive issues are still there, so on Tuesday you decide to try eliminating the tomatoes and your symptoms once again return. Well, it could be that the eggs from two days prior are actually causing your migraines and digestive issues, and it’s just taken this long for the sensitivity symptoms to appear. Additionally, food sensitivities can produce a wide array of symptoms depending on which area of your body the antibodies attack. So you may not even realize that your skin rashes or the joint pain you suffer from regularly are diet-related. Fortunately, with a scientific approach, you can take out the guesswork and identify which foods are causing your symptoms. The best way to discover your food sensitivities is to complete an elimination diet, which is where you eliminate the most common inflammatory foods to from your diet and then add them back in one at a time to see if you have a reaction. It’s like getting to do your own science experiment on your diet! I walk you through exactly how to do this (including providing recipes and shopping lists) in The Myers Way® Comprehensive Elimination Diet, and here’s an overview how it works. First, you’ll go through the elimination phase. One component of this phase is to remove the most toxic foods from your diet for good! These foods are damaging to your health, so even after completing the elimination diet, you won’t be adding these back in. *Gluten and dairy are the top 2 most inflammatory foods and I do not recommend ever adding them back in, particularly if you have an autoimmune or thyroid condition. Once you’ve removed all of these foods from your diet, you will begin to slowly reintroduce the inflammatory foods one at a time in order to test your body’s response to individual foods. Specifically, you will eat the food three times a day for three days. The idea here is to temporarily bombard your system with each food to produce a noticeable and definitive response. If a food is causing inflammation for you, I want to give your body the best chance to determine that, rather than letting silent inflammation creep in! You also want to make sure your results are clean and reliable, which is why you’ll test only one food at a time. Note that you can follow this same process with any food if there is a food not listed that you would like to test. For example, if you suspect you are sensitive to avocados you can remove them from your diet for 2 weeks and follow the same reintroduction protocol to gauge your body’s response. By paying close attention during this phase, you will be able to pinpoint exactly which foods trigger a reaction and what types of symptoms they produce. This can be a very enlightening and empowering process to finally identify what’s been causing your everyday symptoms, and best of all, put an end to them! I always recommend an elimination diet first because your body knows better than any test. However, even a comprehensive elimination diet only tests the most common inflammatory foods. If you are looking to go a step further, food sensitivity testing is a great way to get a more comprehensive analysis of different foods in order to be as informed as possible. I’ve personally found the best results with a company called Cyrex, which uses a blood test to measure your immune response to 180 foods in both their raw and cooked form. Each food is then given a green, yellow, or red light ranking, so you know which foods are safe, which to watch out for or minimize, and which to avoid completely. The advantage of doing the blood test in conjunction with following an elimination diet is that it lets you collect as much information as possible about what is going on inside your body. The downside of this type of testing is that it is not always 100% accurate. If your gut is leaky, you may show a reaction to food particles that are escaping into your bloodstream that would not normally trigger an immune response if your gut was healthy. Also, if you’ve already removed a food from your diet for health reasons, you could get a false negative since your body is not currently producing antibodies for that food for the test to detect. At the end of the day, how you feel is the best indicator. Knowing and really listening to your body is going to be what gets you the best results.